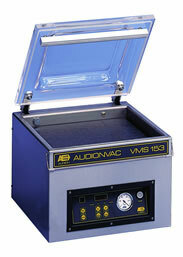 The full line of Packaging Aids Corp. Audionvac vacuum chamber bag sealers. PAC Aids Model VMS153H Table Top Vacuum Chamber Sealer with programmable computer controlled interface with digital displays. The Packaging Aids Corp. Audionvac Vacuum Chamber Bag Sealers are of the latest design and engineering. With its compact construction, stainless steel frame & chamber and high strength transparent lid, the Audionvac Chamber is U.S.D.A. approved. All models except the VMS43 & VMS53 are computer controlled with electronic digital displays. The electronic board is designed to operate in an adverse environment. The board can easily be setup with up to nine different programmed settings for individual applications. With just a touch of a button the setting can be changed when the job changes. The VMS43 & VMS53 have analog controls for the seal & vacuum cycles. In addition each sealbar on the Audion Vacuum Chamber features dual side-by-side 1/8" wide seals. Five table top models are available--VMS43, VMS53, VMS133, VMS153, VMS163-2. 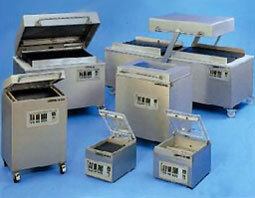 There are four single chamber floor models--VMS223, VMS233, VMS333 and VMS363. The VMS163-2 and the four single chamber floor models have two sealbars in the chamber, effectively doubling their productivity. The VMS253, VMS263, VMS283 and VMS503 are the double chamber floor unit2, one chamber can be loaded while the other is cycling, greatly improving productivity. Each double chamber has four sealbars, two in each chamber. In addition, the double chambers are equipped with a pneumatic lid that automatically opens and closes, to maximize operator efficiency. The high vacuum/capacity pumps are extremely effective and efficient in packaging. The reduction of atmosphere averages 98% on most applications. Another special feature of the Audion-Vac is soft air return, which is designed to protect delicate products. Options available on most Audion-Vac Vacuum Chambers include: gas flush cycle, vacuum level sensor, biactive seal bars, multi-cycle capability--call for more information. VMS43 10.5" x 12.25" x 3.25" 10.5" x 1/8" .15 HP 115V 17.25" x 12.5" x 11.5"
VMS53 10.5" x 12.25" x 4.75" 10.5" x 1/8" .6 HP 115V 17.25" x 12.5" x 11.5"
VMS133 16.5" x 14.5" x 7" 16.5" x 1/8" 1 HP 115V 20.25" x 19" x 17.25"
VMS153 16.5" x 14.5" x 7" 16.25" x 1/8" 1.25 HP 115V 20.25" x 19" x 17.25"
VMS163-2 16.25" x 18" x 6.5" 16.25" x 1/8" (two) 1.25 HP 115V 24" x 19" x 17.25"
VMS223 23" x 20" x 8" 23"(1) or 20"(2) 3 HP 230V 3-ph 28" x 28" x 40"
VMS233 20" x 20" x 8" 20"(2) 3 HP 230V 3-ph 28" x 29" x 41"
VMS333 31" x 21.5" x 8" 21.5"(2) or 31"(2) 5 HP 230V 3-ph 36" x 32" x 44"
VMS363 43" x 26" x 10.5" 26"(2) or 43"(2) 5 HP 230V 3-ph 36" x 35" x 44"
VMS253 27" x 21" x 9.5"(2) 24"(4) 3 HP 230V 3-ph 59" x 32" x 43"
VMS263 27" x 25" x 9.5"(2) 24"(4) 5 HP 230V 3-ph 59" x 36" x 43"
VMS283 27" x 34" x 10"(2) 24"(4) 5 HP 230V 3-ph 59" x 48" x 43"
VMS503 45" x 34" x 12"(2) 43"(4) 12 HP 230V 3-ph 95" x 48" x 46"
Vacuum Chambers usually ship in 2 weeks, FOB: San Rafael, CA--Call for availability.